Souljerky: "Beatific Soul: Jack Kerouac on the Road"
"Beatific Soul: Jack Kerouac on the Road"
For some devotees of Jack Kerouac, seeing the scroll on which he typed On the Road is perhaps a bit like what viewing a relic of a favorite saint is for others. After all, he did once tell an editor that he couldn’t alter the book’s manuscript because it had been inspired by the Holy Spirit. A portion of the 120-foot scroll—whose ending Potchky, Lucien Carr’s dog, ate—was recently unfurled and on view in “Beatific Soul: Jack Kerouac on the Road,” at the New York Public Library; a fascimile of the scroll is still on view for a few more weeks, along with a glut of journals, artworks, photographs, and writings culled from this and other icons of the Beat generation. It’s a feast of a show, reaffirming some myths about Kerouac and his work—lots of drugs, but dutifully in the name of spiritual exploration—while dispelling others—so much for “spontaneous prose”: while he did type the scroll in three weeks in April 1951, he had been composing it for much longer with drafts and notes. 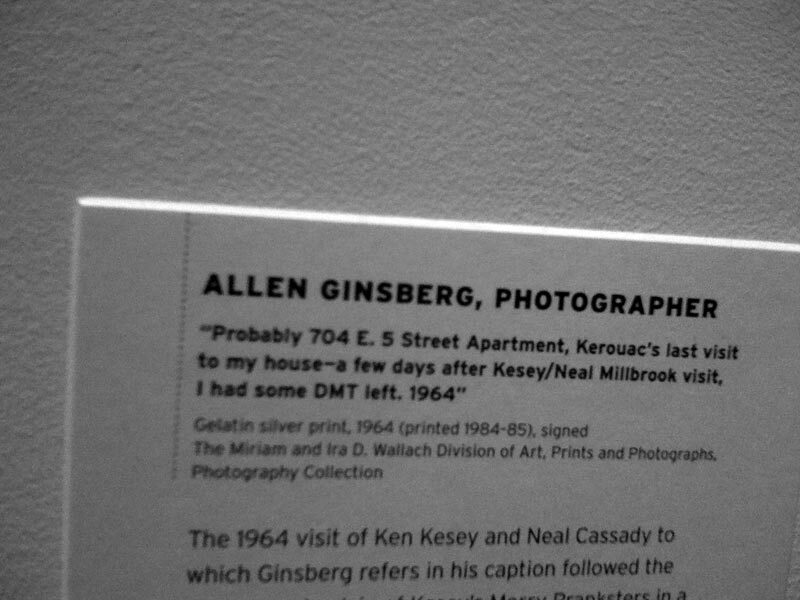 Scattered throughout the exhibition are some of Kerouac’s personal belongings, like a harmonica, an unfinished pack of chewing gum, and Buddhist bells, all of which take on a similarly fetishistic appeal behind their glass cases. Kerouac was always clear about what he wanted the Beat movement to stand for: a spiritual and sexual liberation aimed at transformation, a revolution in consciousness that would alter the country. He wrote in a diary entry under the heading “The Ideal of the Beat Generation”: “Beat doesn’t mean tired, or bushed, so much as it also means beato, the Italian for beatific: to be in a state of beatitude, like St Francis, trying to love all life, trying to be utterly sincere with everyone, practicing endurance, kindness, cultivating joy of heart.” He himself failed to live up to the ideal in many ways—anti-Semitism, homophobia—and eventually came to feel that his fellow Beats (Ginsberg, Burroughs, Cassady, Carr) had betrayed the ideal and him. But much of his writing, particularly On the Road, is still revered for its portrayal of the road trip as quintessentially American, and as symbolic of a spiritual journey. Words from On the Road like “for life is holy and every moment is precious” might seem hackneyed in another context today, but when Sal says them, the cynicism fades, at least a little. 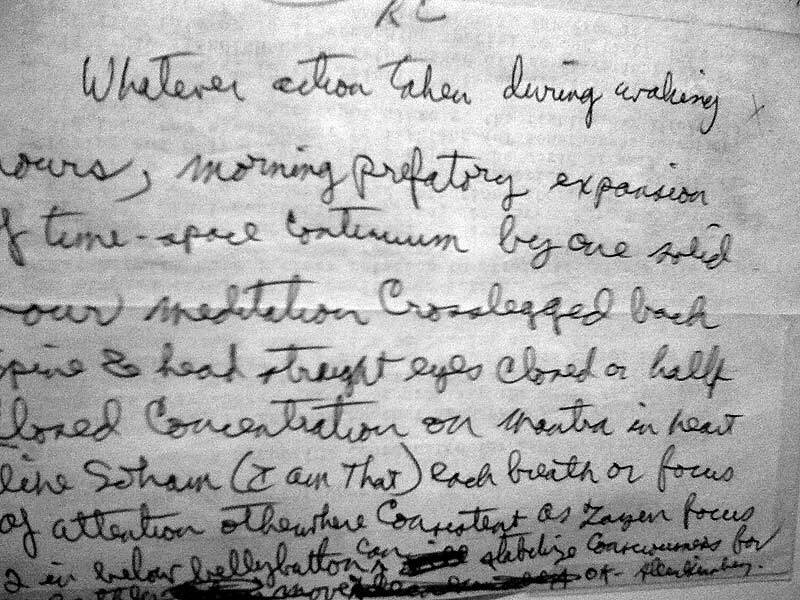 For Kerouac, writing was a spiritual discipline, and the exhibition attempts to trace how his interpretations of Christianity and Buddhism influenced changes to the manuscript for On the Road (there are three typescripts, heavily altered in response to prudish, libel-phobic editors as well as Kerouac’s own reinterpretations of his experiences and friendships). 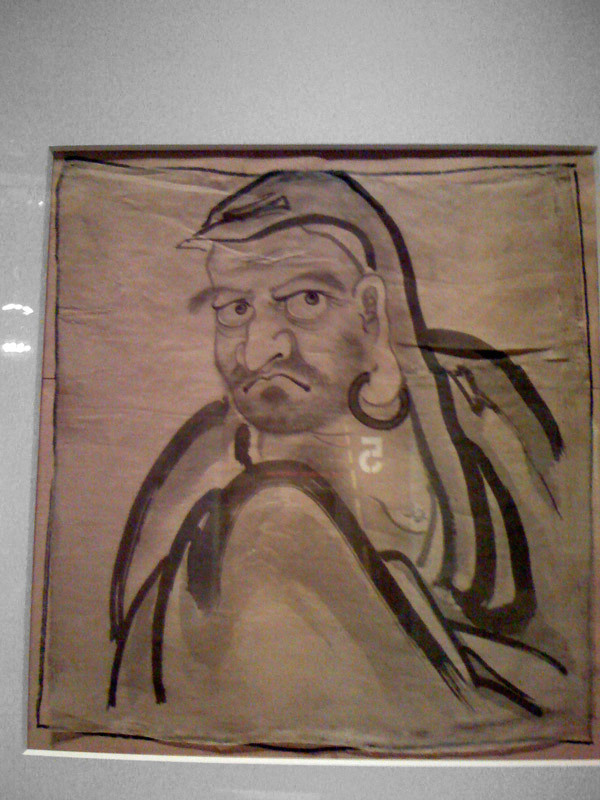 Raised in a Roman Catholic household, he began studying Buddhism and the sutras in the early 1950s, supposedly having had the dharma revealed to him in a library in San Jose when he opened a book on Eastern literature; Buddhism’s emphasis on the transitory nature of existence strongly appealed to him. 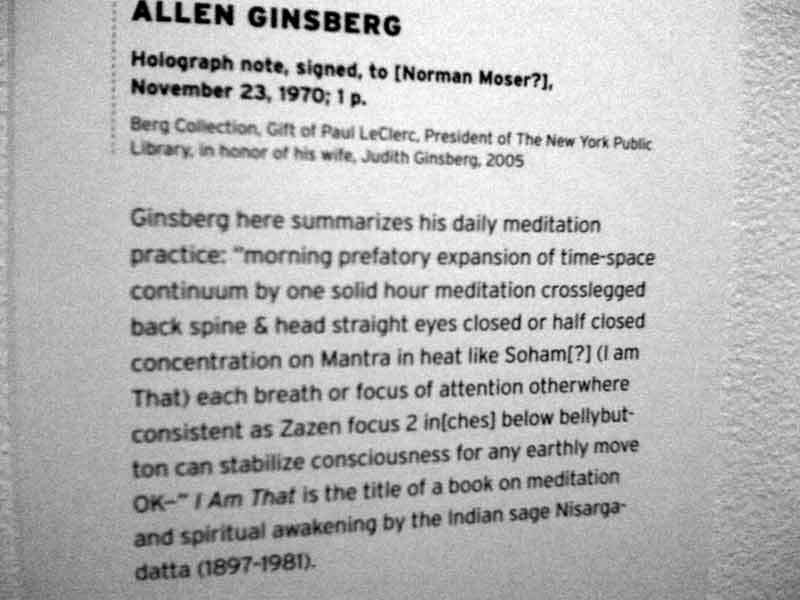 He wrote extensively in his journals about its teachings and about meditation, a practice that played off his interest in dreams and consciousness. 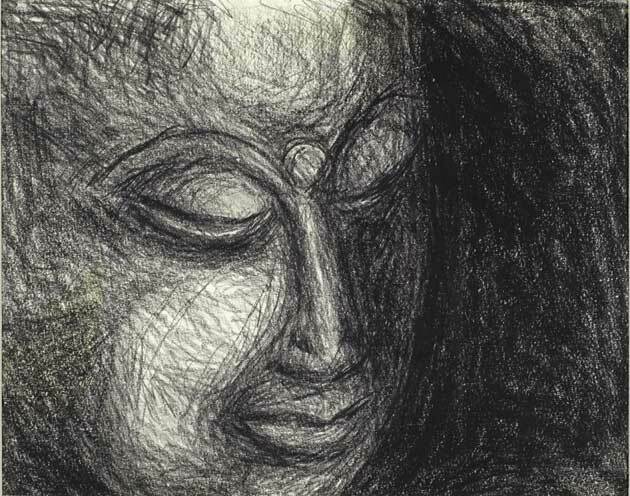 In one notebook he writes of a “Dawn Samadhi—The dreamless sleep,” in which he experiences “a vision of Citta-Vritti-Nirodha.” Yet his own spin on Ishvara Pranidhana, or devotion to God, was expressed strongly in his journals as well as his artwork; and by the late 1950s he had shifted from being a “Christian Buddhist” to a “Buddhist Christian.” Kerouac’s struggles with identity and spiritual beliefs help explain why writing was such an essential outlet for him, and why his work continues to resonate with so many readers. It’s a pleasure to roam among all these works and figures, from Gary Snyder’s Rinzai-influenced poetry to photos of William Burroughs looking swank in Paris. Embedded in all of them are layers of stories. But if you can’t make it to the show, there is an accompanying book, by Isaac Gewirtz, the show’s curator. Or better yet, start by reading Kerouac’s own words. Exhibition link. Catalogue. Kerouac's spiritual texts in archive at NYPL. Foremost credit goes to my wife Erin for her tireless patience + support of this endeavor. Thanks to Barry Silver for the artwork in the above banner and for his friendship, to Robert Beer for the illustrations. Thanks to Eddie Stern for his ongoing support and for providing inspiration. Thanks to my fellow farmers at One Digital Farm for help growing this. 05 Dec 07 linda on Pat Robertson On Yoga: It Get's Spooky! 04 Dec 07 bb on Pat Robertson On Yoga: It Get's Spooky! 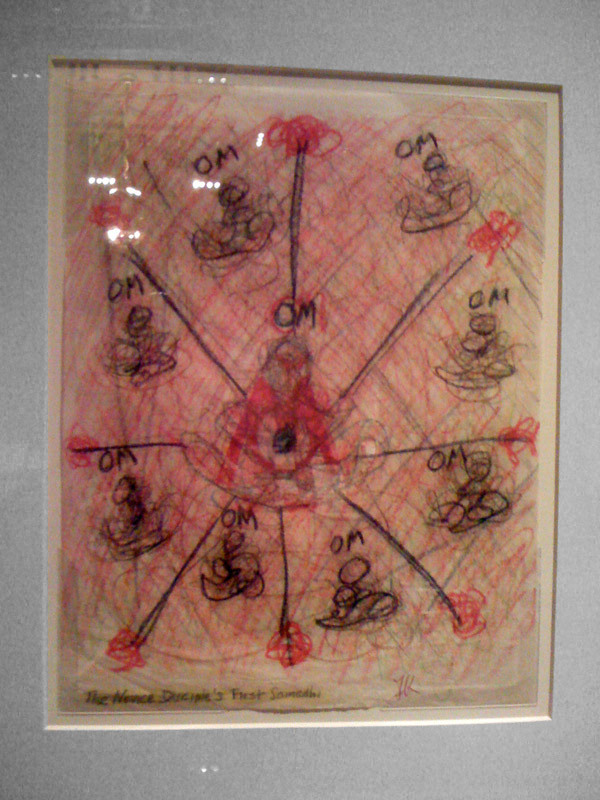 02 Dec 07 Antonio Lopez on Pat Robertson On Yoga: It Get's Spooky! 19 Aug 07 Jesse on Yoga Zombies! We Are Them. They Are Us. 17 Aug 07 Jesse Gordon on David Milch Says, "See God Kai!" 05 Jul 07 gbSk on David Milch Says, "See God Kai!" 02 Jul 07 Spiros Antonopoulos on David Milch Says, "See God Kai!" 02 Jul 07 Jesse Gordon on David Milch Says, "See God Kai!" 26 Sep 07 desi upstart on Reincarnation of Bahucharaji, Patron of Indian Eunuchs? 29 Apr 07 Penny Puja Patel Wiliams on Reincarnation of Bahucharaji, Patron of Indian Eunuchs? 14 Apr 07 frelkins on Reincarnation of Bahucharaji, Patron of Indian Eunuchs? 13 Apr 07 gbSk on Reincarnation of Bahucharaji, Patron of Indian Eunuchs? 13 Apr 07 bb on Reincarnation of Bahucharaji, Patron of Indian Eunuchs? 13 Jun 07 vel yogendra on More Ardh Kumbh! Naga Baba's! Videocasts! 03 Feb 07 Susan on Are Mirror Neurons Evidence Of Nondual Reality? 06 Feb 07 Alam on Puzzle: Jigsaw Jai Sri Ganesha! 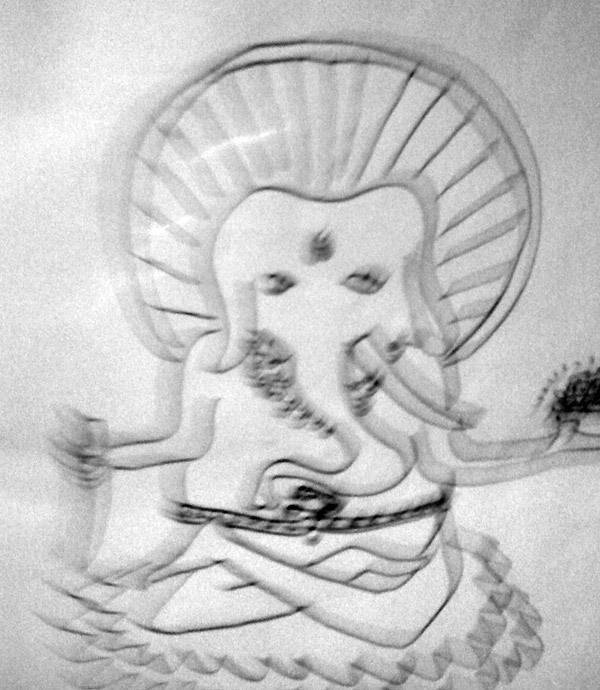 18 Jan 07 Sonya ki Tomlinson on Puzzle: Jigsaw Jai Sri Ganesha! 26 Dec 06 Andy on Puzzle: Jigsaw Jai Sri Ganesha! 21 Dec 06 Spiros Antonopoulos on Puzzle: Jigsaw Jai Sri Ganesha! 20 Dec 06 Susan on Puzzle: Jigsaw Jai Sri Ganesha! 17 Jun 07 Curious coincident on The American Aghori: Orientalist Sensationalism? 01 Mar 07 jaime hakkarainen on The American Aghori: Orientalist Sensationalism? 15 Feb 07 Kapalnath on The American Aghori: Orientalist Sensationalism? Souljerky: Dried chunks of soul for you to chew on.